Graduating seniors and members of the Class of 2018 are pictured in front of their former elementary school – Tangier Smith. Members of the Class of 2018 visited their former elementary school – John S. Hobart Elementary School. 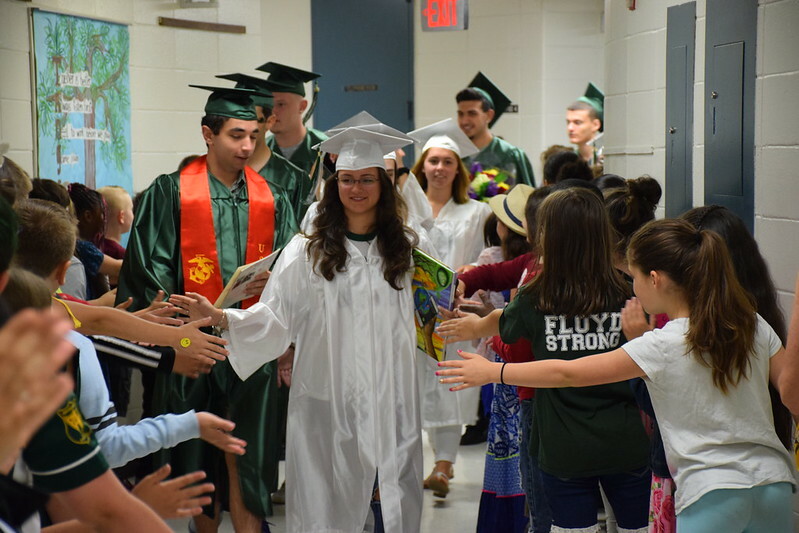 Today, nearly 250 members of the William Floyd High School Class of 2018 participated in the district’s second annual “Graduation Walkthrough,” an opportunity for the seniors, donned in their caps and gowns, to visit their former elementary schools – John S. Hobart, Moriches, Nathaniel Woodhull, Tangier Smith and William Floyd. The event is designed to inspire current elementary students on to great things in their academic careers, as well as give the graduating seniors an opportunity to go back to where it all began for them and express their gratitude to their former teachers, teaching assistants and principals. With “Pomp and Circumstance” playing on each school’s public address system and elementary students lining the halls of each school, the soon-to-be alumni were welcomed, congratulated and cheered on by the elementary students and staff for all that they have accomplished. See additional images and clips of the Graduation Walkthrough at Tangier Smith Elementary School and John S. Hobart Elementary School below!